Modern musicians ear plugs are a fabulous solution for music lovers as well as anyone who finds the world is just too noisy for comfort. More and more people are regaining control over their noisy world by choosing to wear musicians ear plugs at work, play and down time. These are available in universal fit models as well as custom versions. Earphones today have become a necessity for many people, and in numerous life situations. 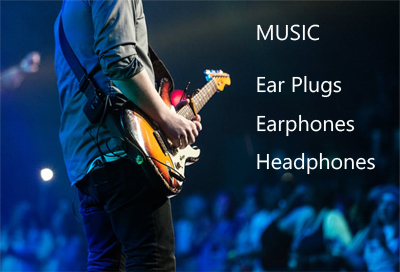 Whether you need a set of inexpensive earbuds for your iPhone, or a quad driver in-ear professional musician monitor, we have a solution made for you. We are experts at creating full custom earmolds that will make your existing earphones fit like a glove, as well as providing top quality full custom earphones when you are ready to move up to a better headset. Browse the departments below. We are sure you will find some surprising solutions, and check back often. We are always adding new products to this department, where high tech music listening products meet great customer service. Tip: Earphones fit inside your ears, like earbuds, isolation earphones, musicians monitors, while Headphones sit over the ear with a headband to keep them on. The headphones, earphones, and earbuds we carry here at Ear Plug Superstore are all special. From hard to find, inexpensive Got Ears? Grandads Earbuds, to value priced active noise canceling headphones for airline travelers, we offer the best solutions we can find that address the real-world problems of our customers.